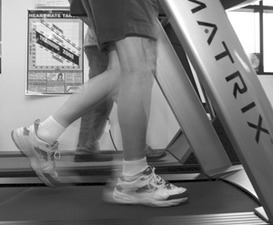 Exercise is a crucial part of staying heart healthy. Get moving!February is American Heart Month, a time to raise awareness about heart disease - the leading cause of death among American men and women. With 2008 in full swing, let us remind ourselves that there are small things we can do each day, during any stage of life, to embrace our hearts, and the hearts of our loved ones. During adolescent years children create habits that set the stage for their adult lives. Nutrition and exercise are two areas where caregivers and parents can encourage kids to make responsible, heart healthy choices. When entertaining kids and teens at your house, encourage them to play outside; challenge them to a game of soccer at the park or toss the Frisbee at the beach. According to data from the Youth Media Campaign Longitudinal Study, 61.5% of children ages 9 to13 don’t participate in any organized physical activity during non-school hours. Beat this statistic by taking an active role in your child’s health – be their playmate and get your heart in shape while encouraging them to do the same. When cooking a heart healthy meal for all ages, be aware of sodium. Excess salt can be detrimental for someone recovering from a heart ailment since excess sodium may increase the risk of high blood pressure. Overweight people who have too much salt in their diet are also at greater risk of heart disease and stroke. Need help in determining how much salt is enough? The American Heart Association recommends that people consume no more than 2.3 grams of salt per day. This translates to about one teaspoon. Strategies for reducing sodium intake can include eating more fresh fruits and vegetables, avoiding processed foods and salty snacks and cooking with herbs and sodium-free seasonings, lemon juice, and little or no salt. Focus on preparing fresh foods for dinner and choose lean proteins like skinless chicken and turkey, fish, soy products, egg whites, and low-fat dairy with side dishes such as vegetables, green salads, beans, sweet potatoes and whole grains like brown rice. “Include a moderate amount of heart healthy omega-3 and monounsaturated fats in your diet such as olive or canola oil, fish, flaxseed, walnuts, and dark green leafy vegetables,” adds Henry. Going out with friends can be a fun stress reliever, however be conscious of calorie intake and try to make heart healthy swaps when possible. One glass of red wine, which has half the calories of a margarita, helps with blood circulation and, in moderation, is good for your heart. Skip the fried calamari and reach for seared ahi instead. Love creamy artichoke dip? Try a fresh artichoke instead and get a boost of much-needed fiber along with an array of powerful antioxidants that are believed to protect against heart disease and cancer. 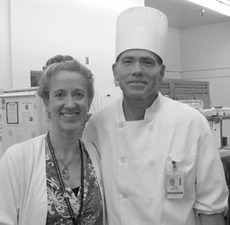 Monica Henry, Clinical Dietician at Saddleback Memorial - San Clemente works closely with Chef Jesus Serrano to prepare heart healthy meals for patients.Besides cocktails and calorie-rich foods, also beware of happy hour smoking. Those who smoke cigarettes on a regular basis are two to four times more likely to develop heart disease than nonsmokers are. Smokers also have about twice the stroke risk than nonsmokers. Still not convinced? Cigarette smoking takes an average of 12 years off the life of a smoker, according to the National Institute on Aging.